What a custom recovery does basically is to overwrite the stock recovery that comes with every device. A custom recovery also let's you perform some more advanced option that can't be done on your stock recovery such as full backup of your popularly known as nandroid backup, restore of ROM, flashing of themes, kernels etc. 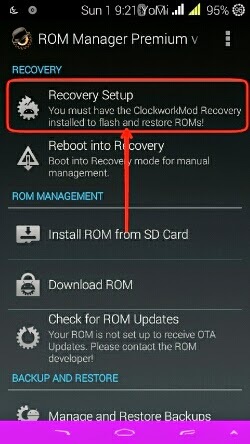 And the most popular use of the custom recovery is to flash both official and mostly known official OS also called ROM. Today I will be giving you a detailed procedure on how to install cwm on your android device. Note that if your device is an mtk device then this method might not work for you. For mtk users check out this link. >> A rooted android device. >> ROM manager. Download here. 1. Download and install cwm from the link provided above. 2.launch ROM manager and select recovery setup. 3. 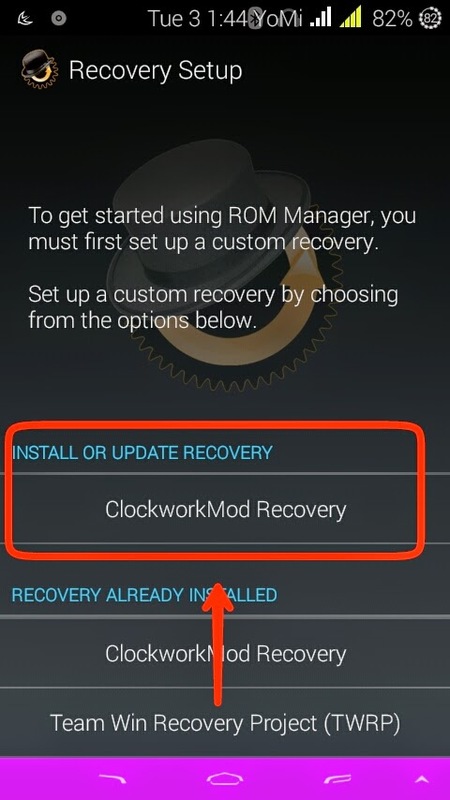 Under "INSTALL OR UPDATE RECOVERY" select ClockworkMod Recovery. 4. You just have to wait for a couple of seconds while ROM manager tries to detect your phone model. 5. If your phone is detected then you just have to click on it and it will try to download the cwm. Make sure your data is enabled. The download size is usually below 10mb. The recovery will be automatically installed after downloading. 6. To confirm if the installation was successful, just go back to ROM manager's main menu and click on reboot into recovery. That's it. You have just successfully installed cwm on your device. If you have any question kindly drop it on the comment box below. Hi am using Samsung Galaxy Note 2, (SGH-I317M) but the note 2 that was detected by CWM was this HSPA+(N7100)... Should I use that? How to get a recovery for a non supported Device ? The 'Porting Methods' like MTK Droid Tools , Easy One Touch Recovery methods were for MT65XX Series only. Those methods donot work on newer MT Series like MT67XX. I am not saying there wont be a method for newer MT67XX. There would be ofcorse. There are Custom recoveries for other MT6735 devices. But not for my one yet. Because my device is not so popular. I have tried Manual Porting as well where you take a recovery from the same chipset and screen resolution device and copy and replace some specific files and repack recovery. I done it. I flashed it. But the phone dont boot it. It reboots back , may be it dont accept it. I have asked help on xda-developers as well , but nobody has replied. Over a month has passed. Thankfully Yomi Tech , a kind hearted , very hardworking guy has replied. Now i have some hope. That i will get a custom recovery for my phone (Xolo Era 4K, MT6735, 1280x720, LP 5.1) are its specs.